"A game changer, for sure." "The new mixed games bible -- for the modern era." "An essential reference for the No Limit Hold'em poker player wishing to take advantage of the next poker boom." "He gets right down to business - no self-serving anecdotes, no fluff. A perfect mix of old theory and new ideas. Loved it." "Mixed Games just got a lot tougher." "...it's good. Possibly too good!" "Your book is incredible, way before its time." "I believe that this will go down in poker history as a must-read. I don't know anywhere else that combines so much information and strategy about so many different games in one place." 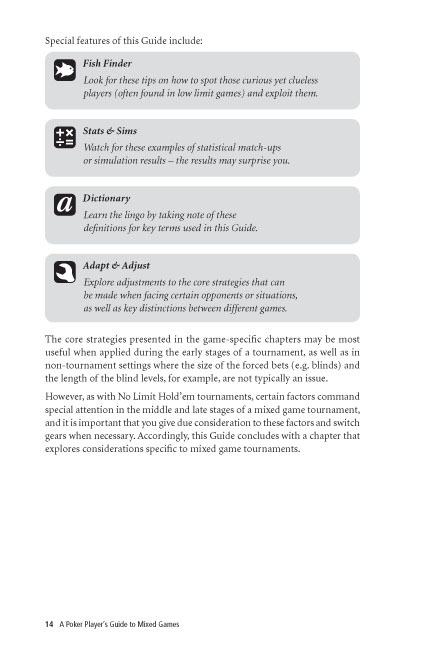 "This is a must-have reference for any aspiring mixed-games player." "It is so well written with consideration to the finer permutations of all of these games." 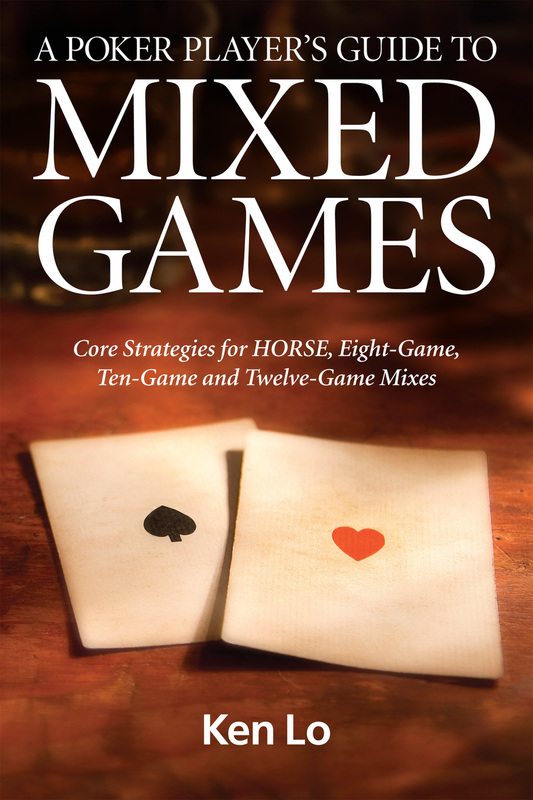 "Best book on mixed games"
Are you craving more variety in your game? Wondering if there's more to poker than No Limit Hold'em? Looking to become a more versatile and well-rounded player? What was once in the exclusive domain of high stakes cash game and elite tournament players, Mixed Games are experiencing widespread growth, increasing in popularity among amateur and professional poker players alike. 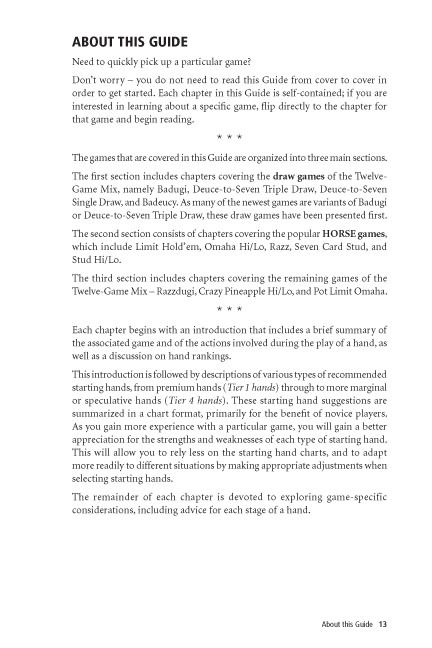 A Poker Player's Guide to Mixed Games is a comprehensive collection of practical strategies bound in a single volume, making it an essential reference for today’s aspiring mixed game player. No part of this book may be reproduced or transmitted by any means without prior written permission. For licensing and permission to use any material from the Guide, contact us. Publisher's note: Selected individual game guides may be made available in e-book format at a later date. However, certain material will only be available in the complete paperback edition.